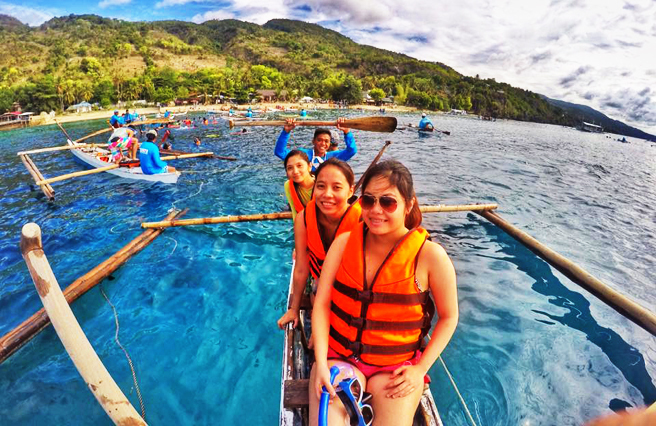 Oslob, one of the municipalities in the southern part of Cebu was just an ordinary town until whale sharks were spotted in the town in 2011. 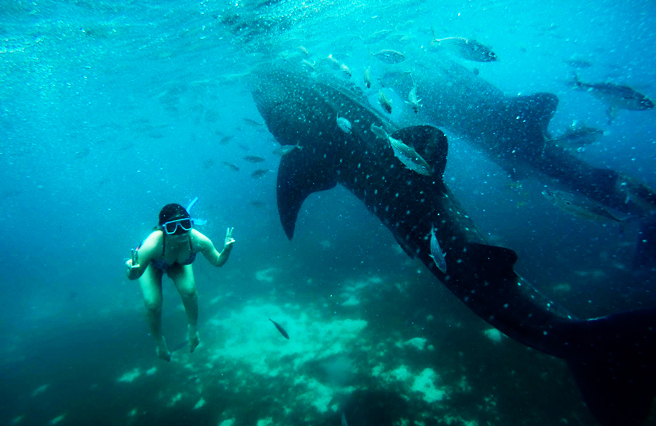 It has then become one of the tourist spots in Cebu where you can have a one of a kind experience to witness and to encounter closely the famous large creatures, Whale Sharks. Whale Sharks (Rhincodon typus) locally known as butanding is a slow-moving filter-feeding animal that is considered as the world’s largest fish, measuring up to 18m and weighing more than 34 tons. They live in tropical and warm places. They also like to swim near the water surface. Actually, 'Butanding' was found first in the waters of Donsol, Sorsogon. 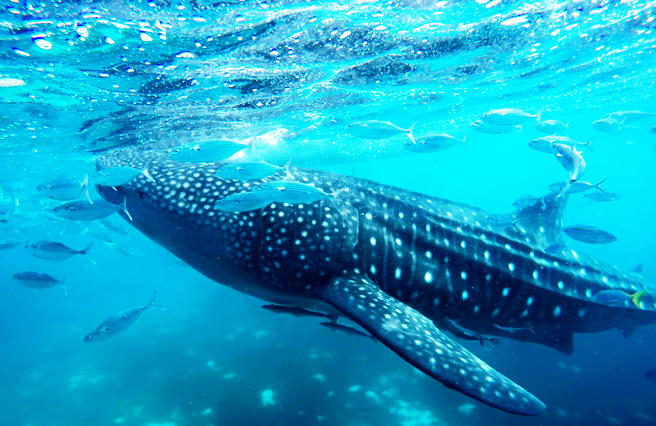 This is also one of the famous sites for swimming with the whale sharks. From Mactan Airport, you can take a cab and tell the driver to drop you off at the South Bus Terminal which will take about 30 minutes ride. Then from the terminal, look for a Ceres Bus going to Oslob and just tell the driver or conductor that you are going to Barangay Tan-awan or where the whale shark watching is. The fare would be Php 124 and will take you 3 hours of ride. While on the bus, you can also check the road and local resorts on the side with a “Whale Shark Watching” signs to know that you have arrived to your destination. We arrived at Oslob almost lunch time already which is not a good time for the whale shark watching. 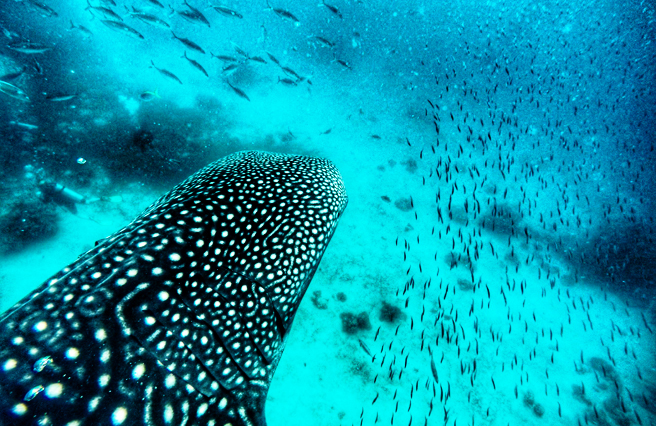 They say that it is best to come early in the morning which is actually the feeding time of the whale sharks and while they are not yet exhausted. That’s why we decided just to do it the next morning and visited first Sumilon Island which is just near the area (will feature it on my next blog too). So in case, it will happen to you too. Don’t worry because there are lots of resorts in Tan-awan, just near the whale shark watching site where you can have an overnight stay for just a cheaper price. Just like we did. 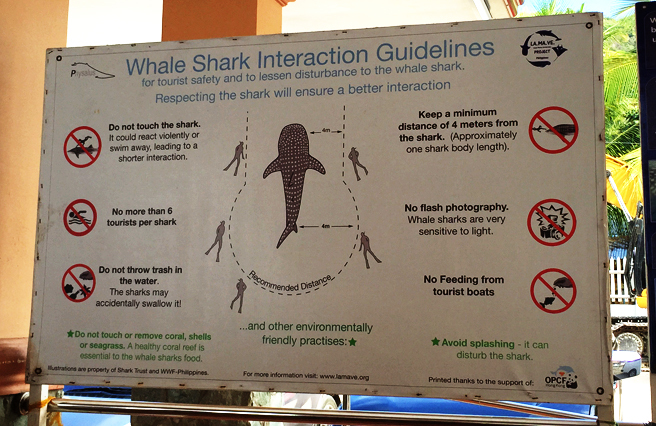 They also offer whale shark swimming or watching and diving. Before starting the activity, you need to register first and pay the right fee. You can register directly on the resort where you have stayed depending on their terms or you can go straight to the briefing center or the jump off site. 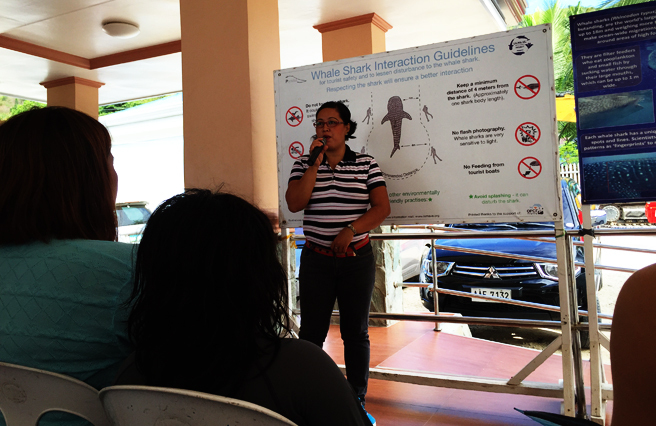 Then before going into the water, you have to attend first the orientation for some rules and guidelines. After the short briefing, all the gears you need will be given - life jacket and snorkeling gear. Then you can hop on to the boat that will bring you to the best spot zone of the sharks, which is only a few meters away from the shore. One purchase of ticket for Swimming and Snorkeling is only good for 30 minutes. 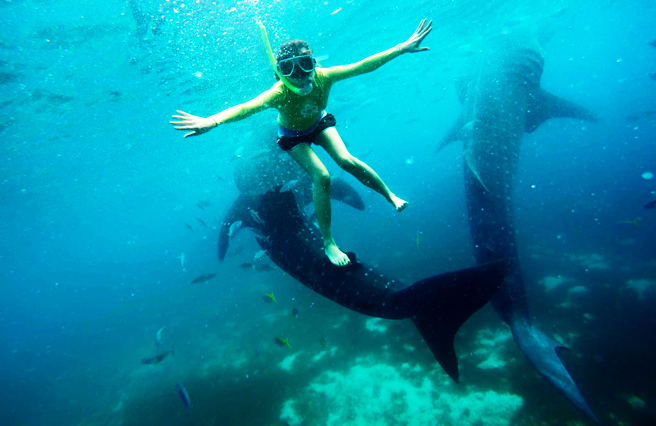 So better jump on the water right away and get a good view and shot with the whale sharks. 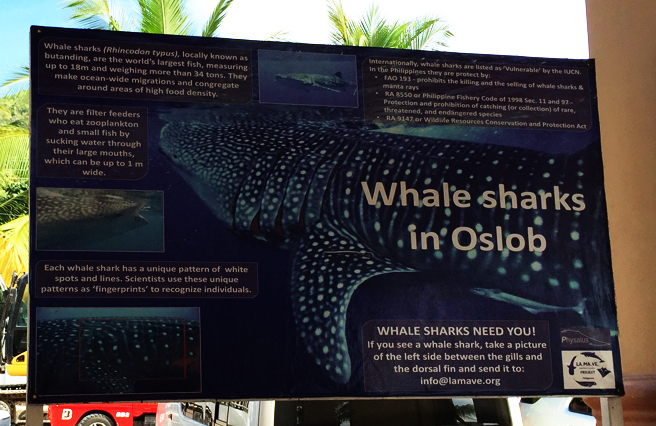 off to see the Whale Sharks! It was a little scary at your first jump into the water as you don’t know what to expect, and you would think that it’s still a 'Shark', and you’re encountering this very large creature. Wew. Then when the fishermen or the tour guides would tell us that sharks are already coming and we have to prepare for the picture. We get panic at times as we are really being careful not to touch them. At the end, I felt a little exhausted while swimming and finding good shots with the whale sharks, but it was really fun! I never imagined myself swimming and seeing these creatures up close. 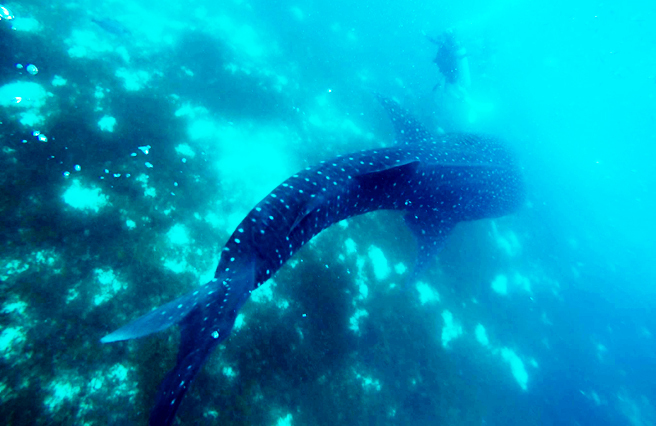 It was really one of a kind experience to swim with the whale sharks. Seeing them up so close is an awesome experience! They are majestic creatures! Try this and you'll get one great memorable travel adventure.